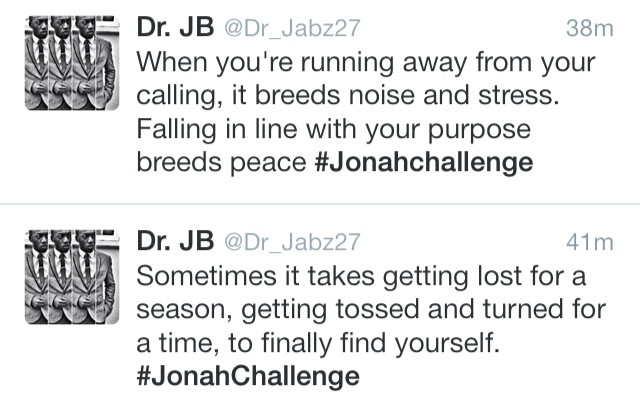 Its amazing to see so many of you on board with the #JonahChallenge! Even those that haven’t done the previous Bible Challenges (#DanielChallenge, #EstherChallenge ,#RuthChallenge, #JamesChallenge and #LWChallenge.) we welcome you! For those that still don’t know what it is, don’t worry! This book doesn’t talk much about the prophecies, but speaks about the behaviour of a prophet. Jonah was a prophet to northern Israel, their enemies were the gentile nation of Assyria ‘Nineveh’ the great city and Jonah was given the unusual instruction from the lord to preach to that city calling them to repentance. Here we see one of the first displays of God’s desire to see all nations saved and how he would do so through Israel! We don’t know how Jonah received this word from God, whether it was verbal, in a dream or vision, writing on a wall or through another prophet, but Jonah didn’t respond with words, he just ran. Rebelled against God’s command. Down is never good when God is up! Notice that verse 3-4 says that Jonah went ‘down’ to Tarshish and ‘down’ to Joppa (which means beautiful- its actually our modern day Tel Aviv). Down is never good when God is Up. Eventually he ended up down in the belly of a whale, which Jonah himself describes as ‘sheol’ which is another name for hell. Are you desensitised to the product of your disobedience? The method of casting lots, basically lottery/ games of chance (Jonah 1:7) – We may be surprised that God essentially allowed for gambling to occur to determine his will for a given situation, but I see it as just being a physical thing that had to happen ‘as a symbol/representation for the human’. God is all knowing so he knows who will draw the shortest straw, roll the die on 6 etc. the method of casting lots is just to convince the carnal man. The practice of casting lots is mentioned 70 times in the Old Testament and seven times in the New Testament. In spite of the many references to casting lots in the Old Testament, nothing is known about the actual lots themselves. They could have been sticks of various lengths, flat stones like coins, or some kind of dice; but their exact nature is unknown. The closest modern practice to casting lots is likely flipping a coin. The New Testament nowhere instructs Christians to use a method similar to casting lots to help with decision-making. 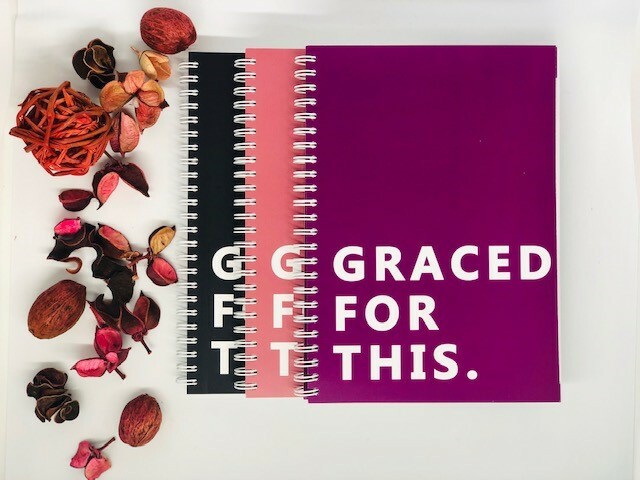 Now that we have the completed Word of God, as well as the indwelling Holy Spirit to guide us, there is no reason to be using games of chance to make decisions. The Word, the Spirit, and prayer are sufficient for discerning God’s will today—not casting lots, rolling dice, or flipping a coin. In verse 9 we read Jonah’s first words, he states his identity and who he believes in, even in the midst of the storm… what can we learn from that? Even in our mess, don’t deny the God that you serve. For this is the one reason why in verse 16 we see that these men who served other gods now feared the Lord God Almighty and made sacrifices & vows unto him. Without Jonah’s declaration, they wouldn’t have known. 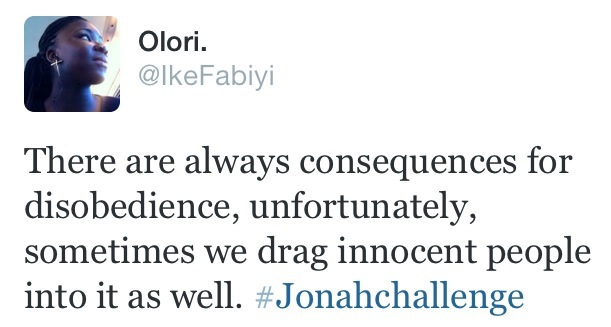 Jonah takes responsibility for his disobedience (Jonah 1:12). In psychology there is something we call ‘Diffusion of Responsibility’ where everybody shares in the blame or the glory of a situation. 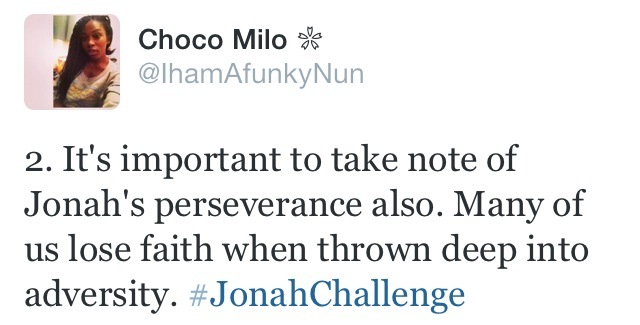 There was none of that there because Jonah stepped forward and said cast me out for the sea to calm down. Very noble, as I know some would have liked to have company in that big whale and therefore drag people down in their plight. Three – Signifies completion or perfection, and unity. Three is the number of Persons in the Trinity. Many significant events in the Bible happened “on the third day” (Hosea 6:2). In this chapter, Jonah really did TRYYY it didn’t he? He really thought he could outsmart his maker. The first thing I noted here is that The spirit or rebellion overtook Jonah so much that he failed to realise the honour that God has bestowed upon him by choosing him to go to Nineveh. He was so blinded by this spirit that his actions were no longer rational. To apply this to our lives, speaking from experience. There are a few times when God has placed something on our minds to do or maybe say to someone but the spirit of ‘why me’ just takes over. Why am I worthy of doing this? I don’t even read my bible everyday, I don’t even pray everyday. But the question is Why not you? These ridiculous excuses would start ringing in our heads as if to say God didn’t know all this before he gave us that task. Anyone can be used as an instrument by God. 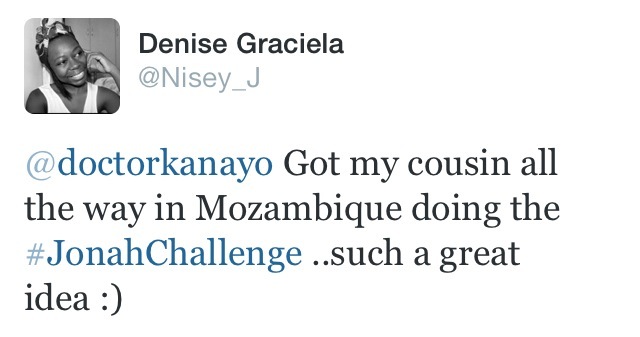 And it is an absolute honour! 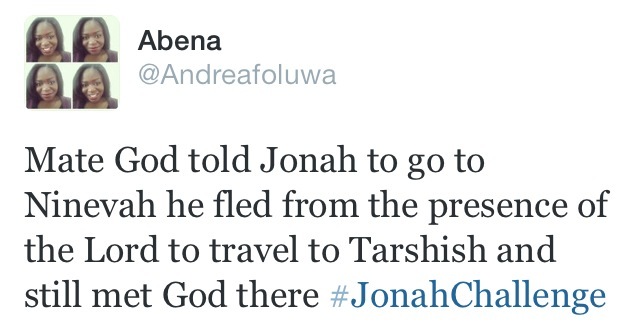 I don’t know why Jonah even thought he could run away from an omnipresent God! Secondly, God’s love is actually amazing. That is such cliche I know but it really is wonderful. Despite Jonah rebelling against him, God still preserved his life by sending this fish. Just like our earthly fathers, they wouldn’t disown us after any little argument or disagreement. They would still reach out for us with open arms because they know we still have a lot to learn. So why would our Heavenly Father not do even more. Don’t get me wrong,this is not an excuse to take liberty for licence and take advantage of this unconditional love, it is just for us to remember that regardless, no matter how lost we are, He still loves us. – Jonah had a responsibility. a calling from God that he chose to ignore. – He fled to the most remote place to “get away” from God’s presence (impossible!). It’s not that God’s presence could not follow Jonah there, but because he made a conscious decision to go against the will of God, he no longer heard or felt the promptings of the Holy Spirit. – The mariners fear and their discarding of their gods: sometimes we face storms in our lives , and it’s only when we turn to the things we have made gods in our lives for help we realise that nothing can help is like the divine power of God. – Why was Jonah sleeping during this terrible storm? Sin can give us a false sense of security. when the effects of sun are ravaging in our lives, sin cause us to feel comfortable in our sinful state, when that is when we are most at danger. – Sometimes we may be rebuked by people who aren’t even followers of God. Why did Jonah need to be told to pray , when he was supposed to be a chosen man of God? – Casting of lots: Jonah still refused to admit to the mariners and himself that he was the cause of this storm. But only the sailors eventually concluded that it was his fault, did he confess. Our sinful nature cause us to hide, to do things in the dark, but every sinful thing we do will eventually come to light. – Jonah conscience was awakened , realising it was his sinful actions that caused this storm, and he tried to flee from the ship. – However, the mariners tried everything within their OWN power to get back to safety but could not, and the storm got even worse. The longer we stay in our sin, the longer we stay in out storm and the nature of the storm worsens. – From having witnessed the power of God in someone else’s life, the mariners were convicted, and began to worship and follow God. Let your life be a testimony to somebody else! As I read this chapter, I’m continuously saying to myself ‘how smart does man think he is’? One thing we often forget is that we are not greater than the creator. God is omniscience ! He knows all. He knows your motive, even when you deny it from men. One key thing that really stuck out to me was his disobedience. God clearly instructed him to do something, but he thought he could do as he pleased and get away with it. Unfortunately for him, he had to suffer. There are consequences for disobedience ! Another thing I picked was that our decisions affect not only us, but people around us too. The people on the ship suffered from the terrible storm. You probably think it only impacts you, but it can either be destroying someone else, or be of an advantage to them. I’m a firm believer that things happen for a reason. There’s a reason God singled Jonah out to go to Nineveh. He could have chosen someone else, someone who wouldn’t have been reluctant to go spread the gospel in a perishing nation. 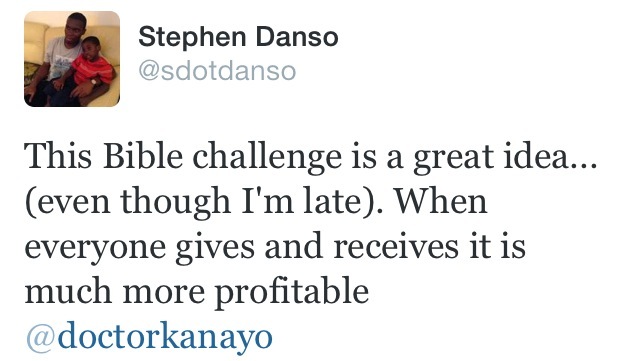 (vs2) – This shows that God really does give people chances to change. A few questions ran through my mind. Did God really need Jonah to go to Nineveh? Couldn’t He have picked someone in Nineveh to do this task? Had Nineveh never heard of the gospel? Couldn’t God have easily destroyed them due to their ‘wickedness’? 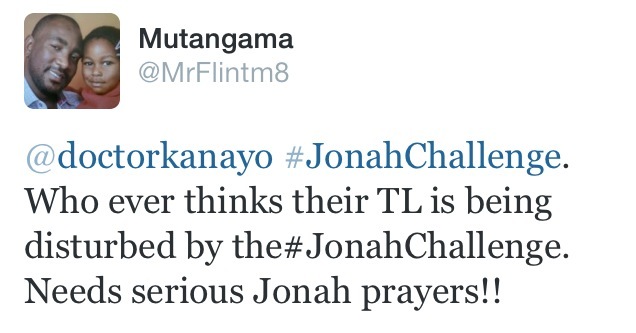 YES, he could have but NO, He gave them a chance by sending Jonah to spread the word to them. (Vs 3) – “Jonah arose to flee to Tarshish from the presence of the Lord”. 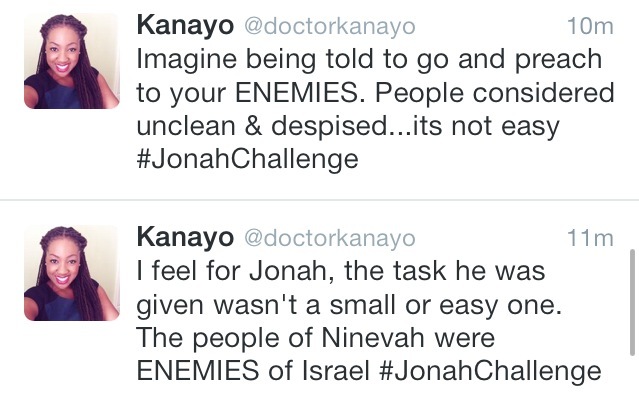 Well this verse made me laugh… at Jonah! 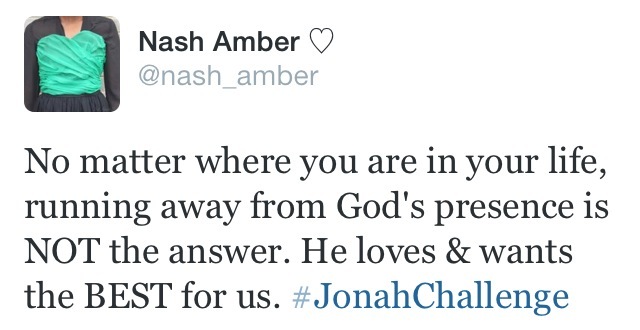 How could Jonah have limited God to a place/situation. Laughing makes me a hypocrite too because to be honest, i do the same sometimes. Don’t we all? We put God into a box in a corner and limit him. We forget that He is omnipresent. He is everywhere, He’s unlimited. How dare we ‘try’ to limit a limitless God? Like Jonah, we try to run away from God when he has given us an assignment/ task to complete; especially if it doesn’t suit our plan or agenda. We disobey Him because we don’t think its possible or because we are scared of the big task in front of us. We chicken out! It shouldn’t be this way. The omnipotent one shows his power here. He has unlimited control over the universe and all creation. We like Jonah also forget this fact about God, we place our confidence in the wrong things instead of having full assurance in the mighty God we have. 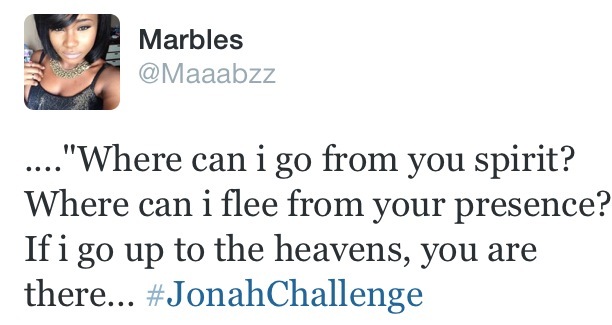 Jonah probably thought he had escaped nicely seeing as he was fast asleep in the next verse. Lol No, No, No! The saying: “You can run but you can’t hide” came to mind here. (Vs 5) – How could Jonah be fast asleep in the storm??? 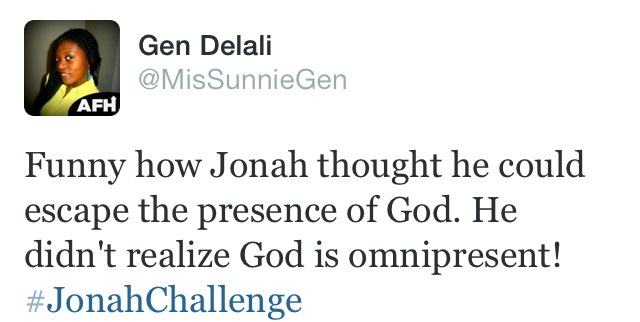 Did Jonah really believe he had fled God’s presence that he wasn’t sensitive or alert to God moving? Had his disobedience (sin) taken him away from God’s presence truly? Sometimes in the midst of the storms of our lives, many of us are fast asleep and not awake to know God is moving and there with us. Our disobedience to His instructions can push us away from Him. (Vs 6) – The shipmaster came to wake Jonah up to call upon His God so they don’t perish. It seemed like they had all called on their gods and Jonah’s was the last resort. Their gods didn’t have the power to save them. In (vs 10) when they found out what Jonah had been doing, they became afraid as they knew that Jonah’s God has great power. Our God is so powerful, even people who aren’t ‘believers’ don’t need to look far/deep to acknowledge his power. His mighty works are displayed for all to see. (Vs 14) – These men also acknowledged God’s sovereignty. “…For you, O Lord, have done as it pleased you”. God does as He pleases. Psalm 115: 3. He doesn’t need permission from anyone to function, he is God! From this experience, the men developed reverential fear for God. They were in awe of his power. This chapter made me laugh!! Jonah reeeeallly thought he was smart pahahahah! 1. Jonah was UNMOVED by the fact that people were living in sin and going to hell. As Christians, we genuinely can get to the point (I think everyone does at one point) where they lose sight of the REALITY of Heaven and Hell and they forget that this is what this is all about Eternity. A lot of the time, many of us would rather be comfortable and do what we ‘want’ at the expense of other’s people’s eternity because the idea of hell and Jesus’ coming seems so abstract or far away so we just want to indulge in our desires for a little longer. Salvation is about other people, we are saved so we can experience God’s love and spend eternity with Him and SHARE it. This desire stems from understanding of the task at hand, love and compassion and I was just thinking – Lord please give me this! Our disobedience in the forms of laziness, sin or whatever else can be a facilitator for someone’s sin because although they will hear the gospel before they die, there was a reason we were in their life or we were sent to them. 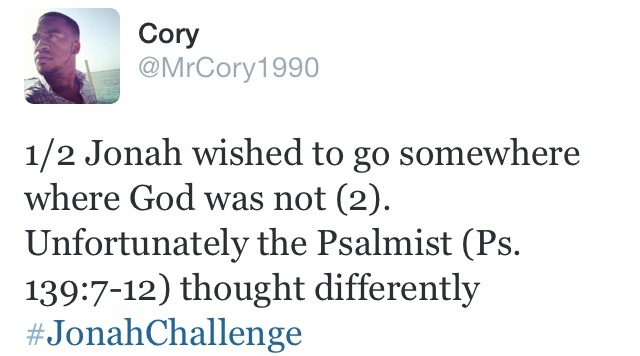 It goes on to say that Jonah went in the opposite direction (v3). We shouldn’t take the word ‘opposite’ just literally, although he may have literally/geographically went in the opposite direction. Whenever you disobey God (sin), you are going in the opposite direction from Him, in terms of your relationship with Him. The way I visualise human relationship with God is very simple – a straight line, on one end is sin/death, and on the other end is God. When you obey God, you move closer to Him, and vice versa. So let’s say Jonah went instead to a town that’s right next to Nineveh… He’d still be going in the opposite direction as that’s not what God commanded him to do. 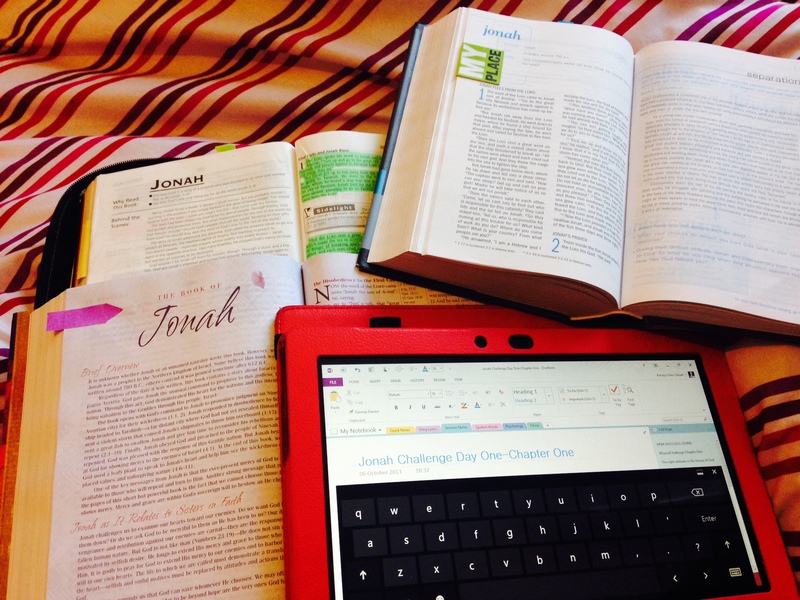 Jonah was not happy with this assignment God had given him. 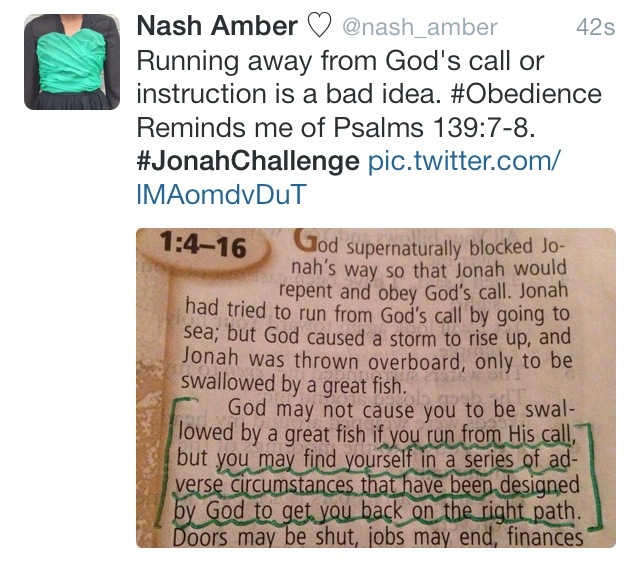 Jonah chose to disobey God’s instructions and went completely in the opposite direction that he was told to go. When we obey God our hearts are tender. If we sin we become uncomfortable. That discomfort should cause us to go to God and confess to Him the sin we have done. If we sin and don’t confess our sins our hearts begin to become calloused and we are no longer sensitive to God’s voice. We become insensitive to the needs of people around us and cannot serve in God’s kingdom as He wants us to. We need to have a clean heart before God so that we can be sensitive to the needs of others. God wants us to be His instruments to share the Good News with those who do not believe in Jesus. Jonah knew why these people were suffering this difficulty and he told them to throw him into the sea and everything would calm down. 1. When God is calling we shouldn’t run away and if it is fear of what we have to do or we are scared we need to remember (2 Timothy 1:7 NKJV) For God has not given us a spirit of fear, but of power and of love and of a sound mind. And he wouldn’t give us anything we couldn’t handle. God can choose anyone, to do His work. His work is important. Be proud/happy to be chosen by the Lord. Verse 5 says Jonah fell into a deep sleep. I believe that when you don’t act upon Gods calling on your life/responsibilities or run away from it, you can go into ‘deep sleep’. A state of just being there. No progressing, not contributing to making things better around you. Just ‘being’. This is a dangerous state to be in. Jonah could have met with total destruction had he not been woken (but God had different plans). We are easy target and vulnerable when we sleep but if we passionately chase God and do what he asks us to, we are kept alert and we move forward and make progress in Him. It’s not only you that’s affected when you run away from your responsibilities. People around you are directly and indirectly affected. Those on the boat were not at fault but still suffered the same as Jonah. Those on other boats on the sea at that time probably didn’t even know anything of Jonah but still experienced the storm. We need to remember that we’re all part of something much bigger. Don’t feel like God can’t do without you or that problems can’t be solved without you. The ship crews’ problem was solved as soon as Jonah was tossed overboard. Don’t BE the problem. Even in yourself, your spirit, you can’t escape who you are. You will know what to do when God has truly laid it in your heart. Verse 9, 11-12 demonstrate this. 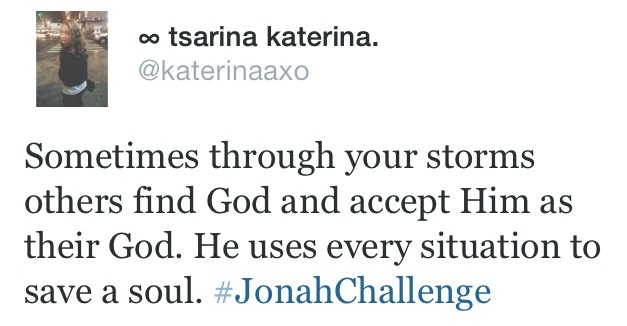 Jonah knew the problem and the solution. A lot of times so do we but its hard to come to terms with it. 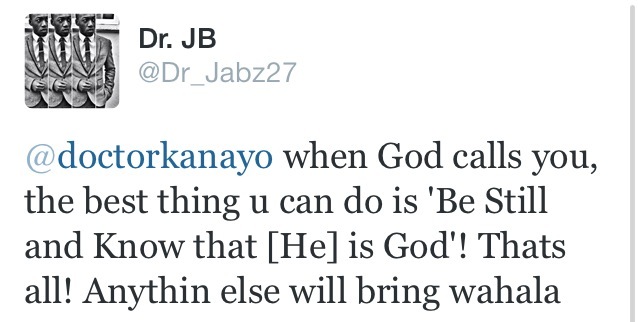 You can never be away from God! He is omni-present. When you feel alone find comfort in his presence and remember that when it feels like he’s far away that’s when he’s closest. When you are thinking about doing stuff which you know are wrong and which you know are sins remember he’s still there. He stays with us through bad and good, thick and thin! What more do we want from our Holy father! When other people are busy worrying about your problem, you’ll be sleeping because you know he has already taken care of it so you will have peace! It was by chance that Jonah’s name was drawn. It’s not by chance that you are alive today! It’s not by chance that you have a loving family! That school/job which you go to is not by chance either! So remember to thank God for everything because you weren’t saved by chance but through His grace and mercy!